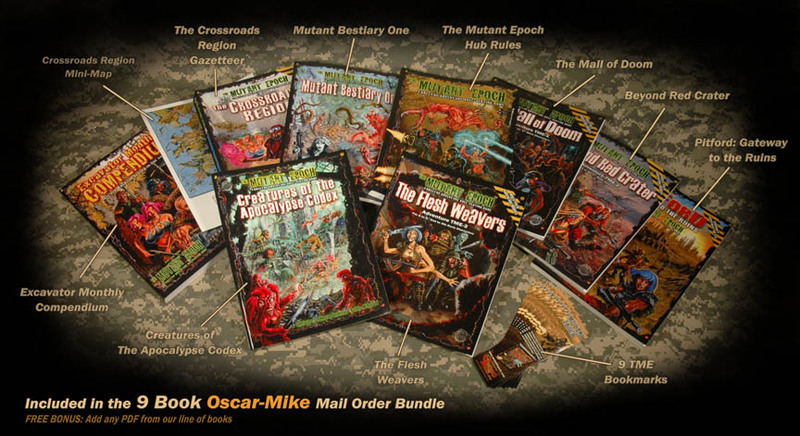 Want ebook versions of The Mutant Epoch role-playing game books? 9 great PDFs together for one great price! Note: This collection of PDFs is being sold through gumroad.com, where we have a seller's account that provides us with an almost commission free sales portal. These are the same PDFs you can buy elsewhere, but we earn 95% instead of just over half. This is it! 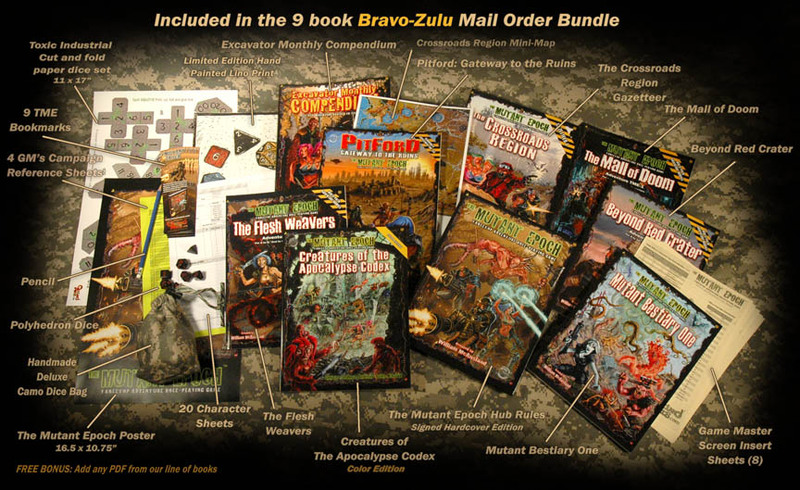 Everything you need to start running The Mutant Epoch Role-Playing Game! Get it all in one box! 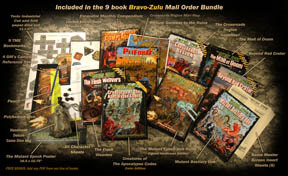 This set includes a stack of our books including a much coveted hardcover edition of the hub rules, 32 game sheets, bookmarks, a pencil, set of polyhedron dice, poster, 8 x 10 Crossroads region map, cut and print paper polyhedron dice set, hand made digi-camo print dice bag, and a limited edition, hand pulled, hand painted, signed, polyhedron dice lino print. In addition, you also get a PDF copy of the Hub Rules, or any other book in our line, delivered electronically as soon as we get your order so you can get started right away! What a deal! The 9 books contained in this set retail at $227.92 alone. At $189.99 you already save $37.93 before all the other extras are added in! We only keep a limited supply of inventory at our game design studio so order your box today! Purpose: Replacement to our old Overwatch Mail Order Bundle. This box has all our books with the hardcover version of Mutant Epoch Hub rules. This is the deluxe set. 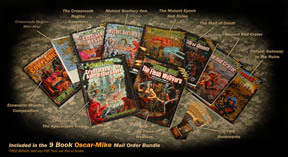 ** Sent the first business day your order arrives, allowing you to check out the rules while you wait for the delivery of your physical books. 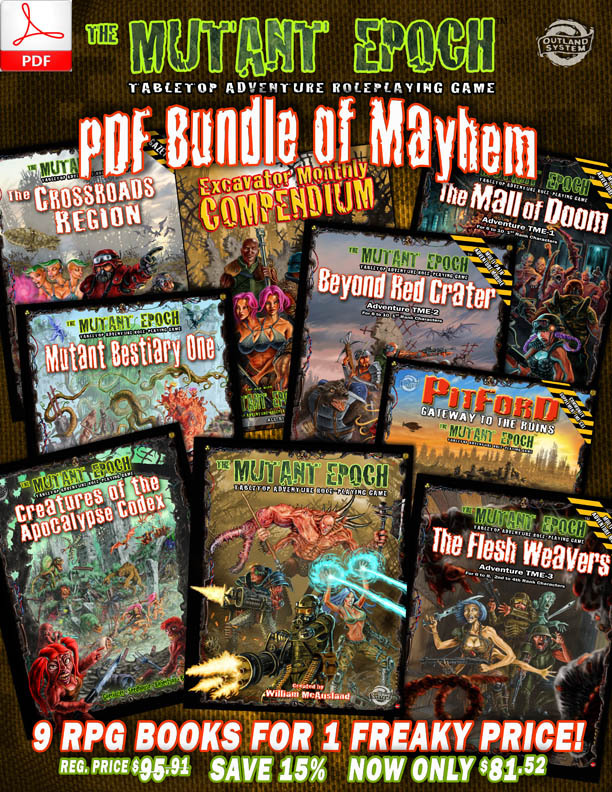 Most people go with the Mutant Epoch Hub Rules in PDF, but you can pick any book you want. Please use the total price as shown above for your country or region you are shipping to. Purpose: A no frills, soft cover collection of all our books in one compact box.